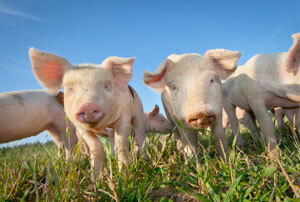 Pigs thrive on the Science of Organic Acids provided exclusively in DPX 9902. DPX 9902 is intended for use in feed for food- producing animals such as pigs, beef and dairy cattle, sheep, goats, poultry, including broilers and layers, and farmed fish. DPX 9902 may function as a nutritive carrier, an anti-caking agent or as a source of iron and other trace minerals and fiber in the animal feed. DPX 9902 is self-affirmed GRAS (Generally Regarded As Safe) in the USA. More info available upon request. Copyright © 2013 Humatech, Inc.